As an educator, I had to constantly be on the lookout for bullying. Whether I saw it with my own eyes or if it was reported to me by my students, I had to make sure it was brought to the attention of the administration. Not that bullying didn’t happen when I was younger, but everyone is more aware of it now and schools are diligent in addressing it. There are anti-bullying assemblies and follow-up mini-lessons in the classrooms. Bullying is even considered a suspendable offense if it happens after school hours if it’s between two students. This makes me wonder something. If bullying is such a big deal when it occurs between people, then why is it okay for us to self-bully? When I was an educational psychologist at a local high school, I had students referred to me for educationally-related counseling. This meant that if there was anything in students’ lives that was impacting their education, they could be referred to me, and, of course, this included bullying. Some of my referrals were for victims of the easy-to-identify type of bullying such as physical or verbal bullying, but sometimes I uncovered covert bullying when I met with students. I don’t want to go off on a tangent, but I must say that teenagers can be amazingly cruel to one another. For instance, my students would share with me how their peers would make backhanded or even in-your-face comments about their appearance and, over time, I could see how this constant attack had an immense affect on their self-esteem and mood. This self-criticism, which I call self-bullying, was certainly part of my life when I dieted. And, oh, the things I would say to myself! You have so many stomach rolls. You’re not pretty. You’re lazy and only fat people are lazy. As I look back, it makes complete sense why I was not in the best of moods. And why would I be? I was constantly berating myself as motivation to change my appearance so I could look a certain way, but I ended up making myself feel worse and worse about who I was as a person. One thing I learned on my journey away from the dieting world was that I really needed to change my way of thinking when it came to my body. When I would have self-bullying thoughts, I began asking myself if I would say this to a friend or to a child? Think about it for a moment. 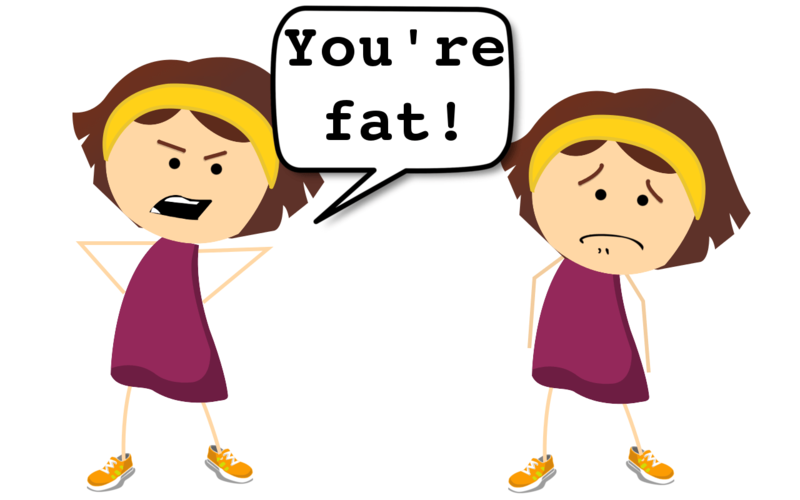 Would you tell your friend or your child, “You’re fat!” Probably not. If I would not say those types of things to others, then why would it be okay for me to say it to myself? Here’s something else that would come to mind during my self-bullying episodes. I would think about my friend who sometimes eats a few too many cookies and gets really mad herself. She feels guilty and belittles herself for her apparent lack of willpower. As a friend, I wouldn’t mirror her anger. Instead, I would express kindness and concern and ask myself what I should say to her in her time of need. I need to reflect those same actions and words back on myself because I deserve compassion too. Those are a few strategies that I have used to combat my self-bullying behaviors. Other approaches are post-it therapy, making peace with the mirror, and retraining my brain to have fewer automatic negative thoughts. These aren’t easy to implement, but my self-bully has not been around much recently, so I know that there’s something to be said about the power of these strategies. I want to leave you with a quote I found on tinybuddha.com. It says, “You will never speak to anyone more than you speak to yourself in your head. Be kind to yourself.” I now know these words have a great truth to them, and I will make a daily effort to integrate this idea into my life. How do you self-bully? Please share in the comment section below. 1From Overcoming Depression: A Self-Help Guide Using Cognitive Behavioral Techniques by Paul Gilbert. Forbidden Foods Are In My House…EEK! Such a great reminder to be compassionate with ourselves as we would be with others. I’ve spent a morning writing down all the negative things I say to myself about my body and myself generally. My internal critic is relentless! Writing down what you say can be really eye opening. Now you are aware of your inner critic and can take a step or two to silencing her (or him)!